Dutch Painter Pieter Cornelis “Piet” Mondriaan, was born March 7, 1872. in Amersfoort, Netherlands The family moved to Winterswijk after his father, Pieter Cornelius Mondriaan, was appointed Head Teacher at a local primary school. Mondrian was introduced to art from a very early age: his father was a qualified drawing teacher; and, with his uncle, Fritz Mondriaan (a pupil of Willem Maris of the Hague School of artists), the younger Piet often painted and drew along the river Gein. In 1892, Mondrian entered the Academy for Fine Art in Amsterdam. He already was qualified as a teacher. He began his career as a teacher in Primary Education, but he also practiced painting. Most of his work from this period is Naturalistic or Impressionistic, consisting largely of landscapes, depicting windmills, fields, and rivers, initially . These paintings illustrate the influence various artistic movements had on Mondrian, including Pointillism and the vivid colors of Fauvism. On display in the Gemeentemuseum in The Hague are a number of paintings from this period, including The Red Mill and Trees in Moonrise and, Evening (Avond) (1908), a scene of haystacks in a field at dusk, hints at future developments by using a palette consisting almost entirely of red, yellow, and blue. Although it is in no sense Abstract, Avond is the earliest of Mondrian’s works to emphasize the primary colors. In 1908, he became interested in the theosophical movement launched by Helena Petrovna Blavatsky. Mondrian and his later work were influenced by the 1911 Moderne Kunstkring exhibition of Cubism in Amsterdam. His search for simplification is shown in two versions of Still Life with Ginger Pot (Stilleven met Gemberpot). The 1911 version is Cubist; in, the 1912 version, it is reduced to a round shape with triangles and rectangles. In 1911, Mondrian moved to Paris and changed his name (dropping an ‘a’ from Mondriaan gradually, he began to fuse his art and his theosophical studies into a theory that signaled his final break from representational painting. While Mondrian was visiting home in 1914, World War I began, forcing him to remain in The Netherlands for the duration of the conflict. During this period, he stayed at the Laren artist’s colony, there meeting Bart van der Leck and Theo van Doesburg. Van der Leck’s use of only primary colors in his art greatly influenced Mondrian. Mondrian published “De Nieuwe Beelding in de schilderkunst” (“The New Plastic in Painting”) in twelve installments during 1917 and 1918. This was his first major attempt to express his artistic theory in writing. After the wrar Mondrian returned to France until 1938 and fllourished in an atmosphere of intellectual freedom and began producing grid-based paintings in late 1919, and in 1920, the style for which he came to be renowned began to appear. In the early paintings of this style the lines delineating the rectangular forms are relatively thin, and they are gray, not black. The forms themselves, are smaller and more numerous than in later paintings, are filled with primary colors, black, or gray, and nearly all of them are colored; only a few are left white. This developed into Thick black lines separating the forms, which are larger and less numerous with more left white than previously. In the 1921 paintings, many of the black lines stop short at a seemingly arbitrary distance from the edge of the canvas, although the divisions between the rectangular forms remain intact. Here too, the rectangular forms remain mostly colored, as in in the “lozenge” works that Mondrian began producing during the 1920s. The “lozenge” paintings are square canvases tilted 45 degrees, so that they hang in a diamond shape. Typical of these is Schilderij No. 1: Lozenge With Two Lines and Blue (1926), also known as Composition With Blue and Composition in White and Blue, which is currently on display at the Philadelphia Museum of Art. One of the most minimal of Mondrian’s canvases, this painting consists only of two black, perpendicular lines and a small triangular form, colored blue. As the years progressed, lines began to take precedence over forms in his painting. In the 1930s, he began to use thinner lines and double lines more frequently, punctuated with a few small colored forms, if any at all. Double lines particularly excited Mondrian, for he believed they offered his paintings a new dynamism which he was eager to explore. In September 1938, Mondrian left Paris in the face of advancing fascism and moved to London. After the Netherlands were invaded and Paris fell in 1940, he left London for Manhattan, where he would remain until his death. Here Mondrian produced Lozenge Composition With Four Yellow Lines (1933), a simple painting that introduced what for him was a shocking innovation: thick, colored lines instead of black ones, as well as Composition (1938) and Place de la Concorde (1943). He also painted New York City (1942), a complex lattice of red, blue, and yellow lines, occasionally interlacing to create a greater sense of depth than his previous works. His painting Broadway Boogie-Woogie (1942–43) at The Museum of Modern Art in Manhattan Is an example of abstract geometric painting and is made up of a number of shimmering squares of bright color. 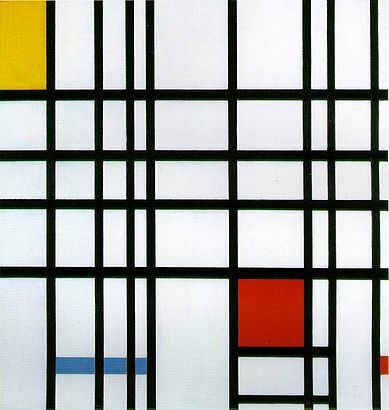 Mondrian then replaced former solid lines with lines created from small adjoining rectangles of color, created in part by using small pieces of paper tape in various colors. Larger unbounded rectangles of color punctuate the design, some with smaller rectangles inside them. Mondrian’s works of the 1920s and 1930s have an almost scientific austerity about them, but are bright, lively paintings, reflecting the upbeat music that inspired them and the city in which they were made. Piet Mondrian returned to Paris in 1919, he set about at once to make his studio a nurturing environment for paintings he had in mind that would increasingly express the principles of Neo-Plasticism. In 1943, Mondrian moved into his second and final Manhattan studio. Tragically, he was there for only a few months, as he died of pneumonia in February 1944. He is interred in the Cypress Hills Cemetery in Brooklyn, New York.On February 2, 1944, a memorial, attended by nearly 200, was held for Mondrian, at the Universal Chapel on Lexington Avenue and 52nd Street in Manhattan.